I started out by perusing Pinterest one afternoon for inspiration. I found about 6 dresses that gave me some ideas and mentally sketched out my plan before getting out the scissors. Is it blue or is it purple? Neither; it’s blurple! 1 – I began by laying the dress inside-out, flat on the floor, and tracing the outline of a dress whose fit I like onto it. 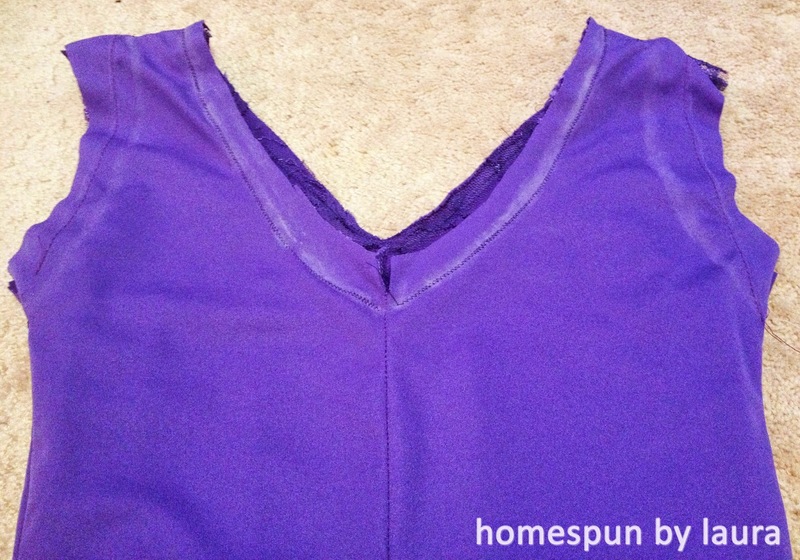 The scalloped bottom hem of the dress was actually part of the fabric and therefore not something I could rip off and reattach later, I worked from the bottom up and had to completely re-create the neckline and shoulders of the dress. 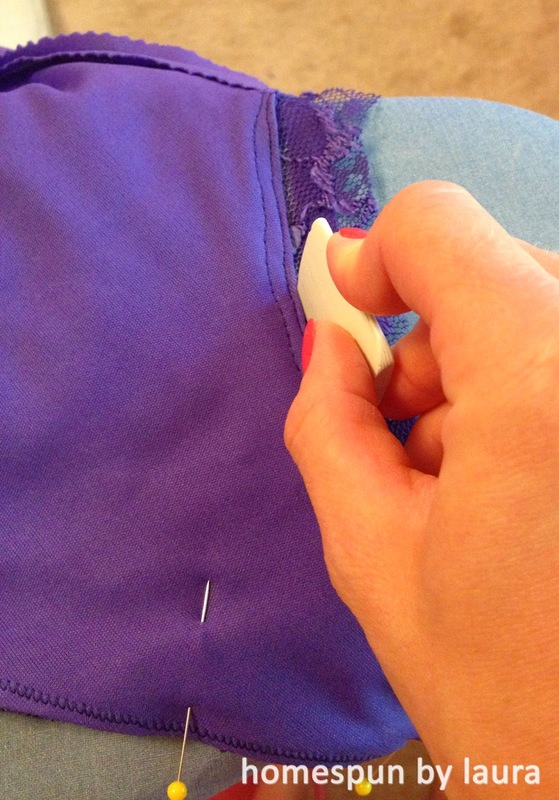 2 – Using a zigzag stitch and white thread, I basted the lining and tried it on to test it. 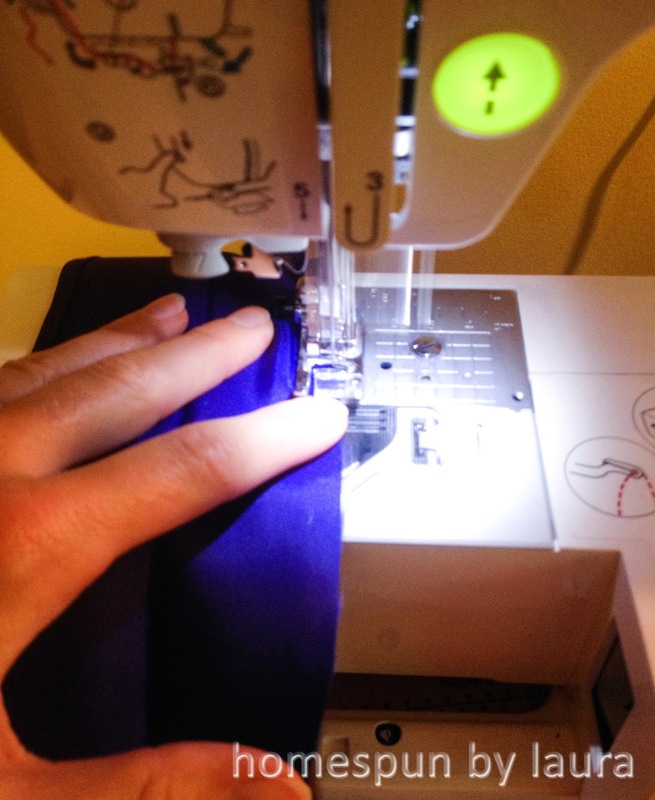 3 – Once I was satisfied with the fit of the lining, I trimmed the excess. 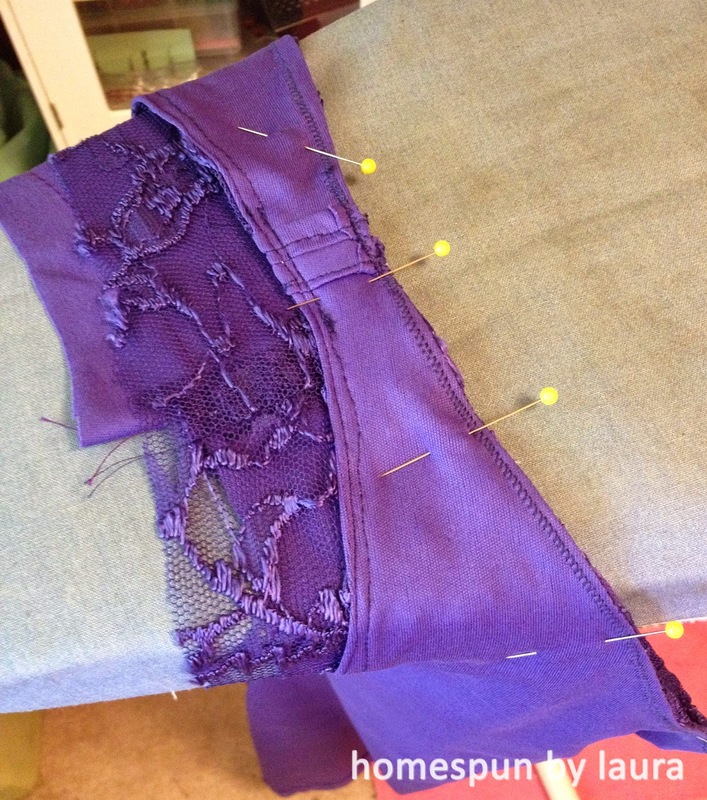 4 – I cut off the shoulder pads, sleeves, and separated the lace outer layer from the lining. Since I wanted a v-neck and, I used another dress with a v-neck to trace out the approximate shape for the top of my dress and sketched out an approximate v-back using the front as a guide. 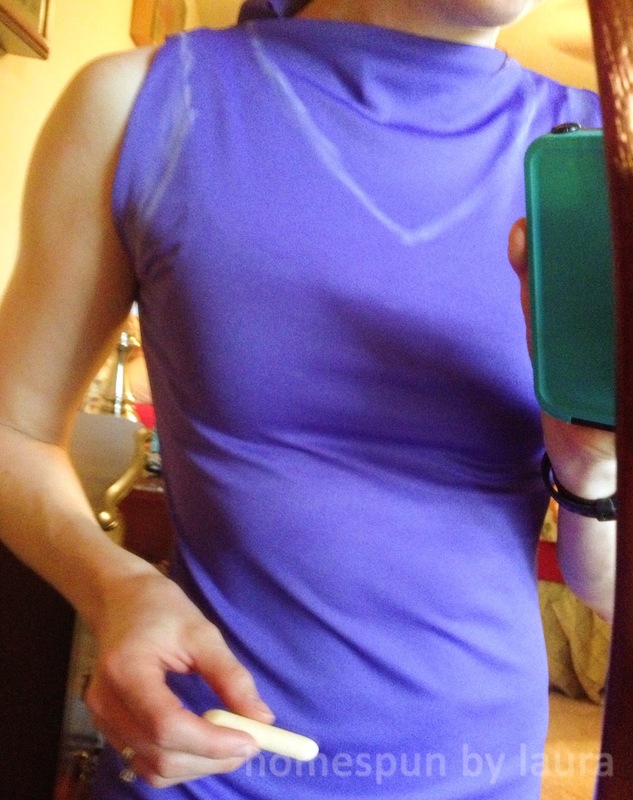 I then basted together the top of the straps and tried it on. I had to re-trace new lines to adjust for the different way the two dresses fall, and once I was satisfied I trimmed down the neck and armholes, leaving about 1.5″ excess. 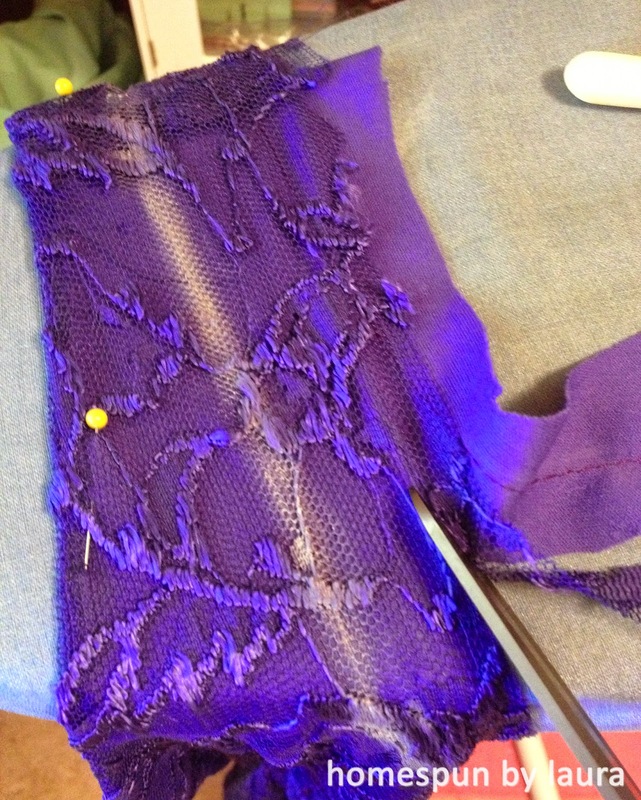 1 – Next, I laid the basted and trimmed lining down over the outer lace layer, which was also inside-out, and traced it. 2 – I basted over the traced line on the lace layer, and like I did with the lining, also basted over the shoulders so I could try it on. Once I was satisfied with the sides and shoulders, I stitched over the basted stitches with ‘blurple’ thread and removed the white basted stitches. 3 – I then basted both layers together at the neck, following the lines I traced out earlier. I had trouble with this step, as I kept putting the dress together in the wrong order. What turned out to be correct after a few wrong attempts was to put the RIGHT side of the lace layer facing the WRONG side of the lining. I’m not sure why I made this part so difficult on myself, but I should never forget it now! The back of the dress turned out to be more rounded than I intended (since the lining is stretchy, I suppose it stretched the V out into a U), but I decided I liked it in the end. this sloppy French braid was the best I could do with my short hair and no brush within my reach! The sleeves and high neck of the original dress had these lovely little buttons that reminded me of the back of my oldest cousin’s wedding dress. Hers was the first wedding I can really remember details of, and one of those is of sitting in the pew and looking at the little buttons that went down the back of her dress. I wanted to mimic that look with this dress. These buttons were perfect for the job and the fact that the little loops were in good condition meant that I didn’t have to do much extra work – no buttonholes and no creating tiny little loops from scraps! 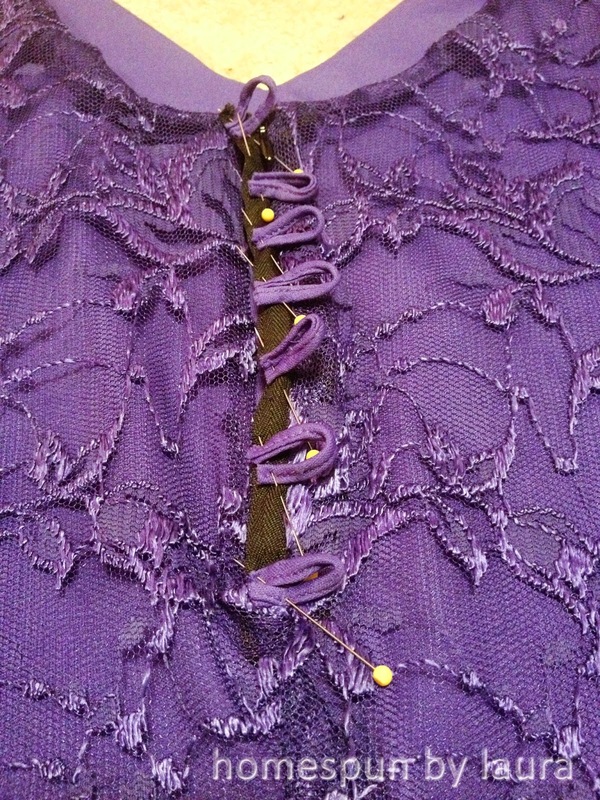 I began by turning the dress wrong-side out and ripping the seam out of the top half of the back of the dress, about 9″. Next, I measured and placed the loops evenly down the back of the new opening and basted them in before adding in the invisible zipper. I used a black one because it was the closest I had to the right color and I didn’t want to drop everything to run to the fabric store for a matching one – which I wasn’t even sure I would find due to the unique color of the fabric. Plus, it’s invisible, so the only part that shows is the pull, and even that is partially covered by the loop and button. 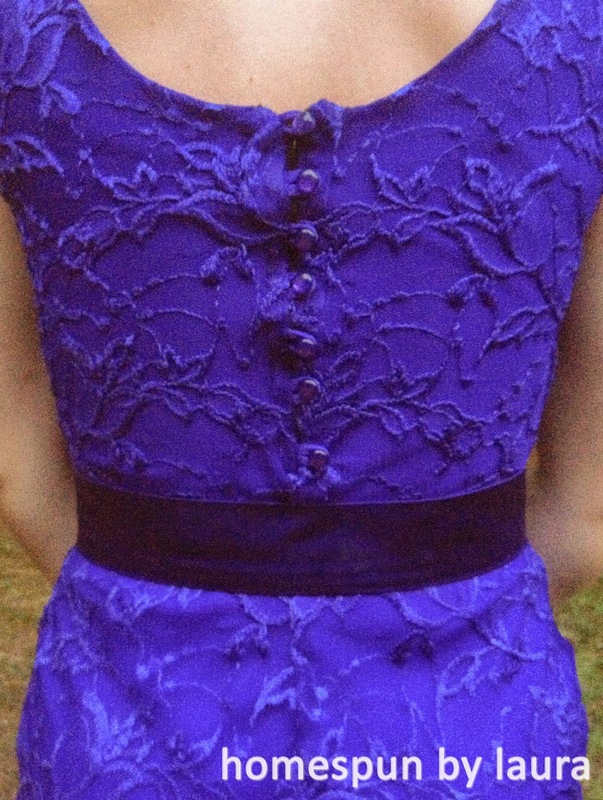 I finished the rest of the dress before going back and hand-stitching the little buttons on, and when it was all finished, it looked like this from behind. 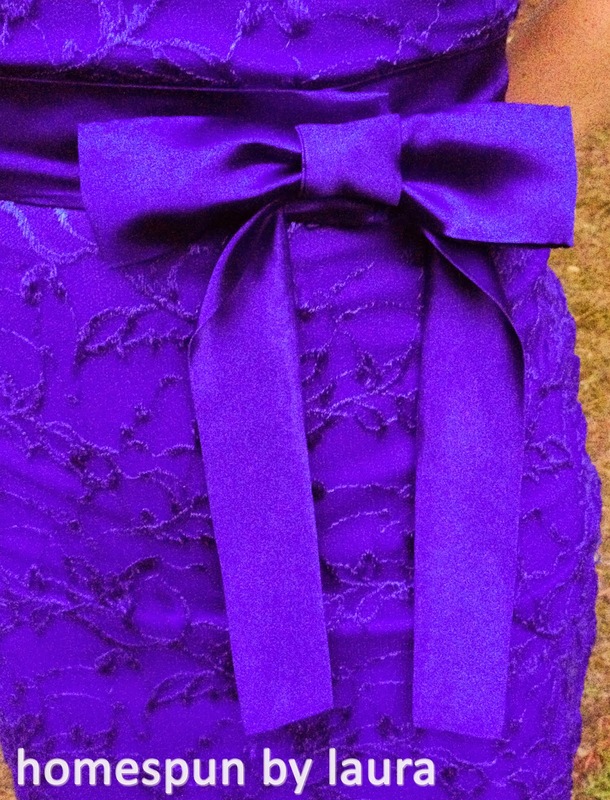 Instead of creating one long strip of fabric and tying it in a bow, I decided to make a belt and use magnetic snaps. To get started, I cut one entire length (45″) down to about 4.5″ wide, using a piece of 2″ ribbon as a template, then stitched it up, leaving the ends open. I made the belt part of the belt by wrapping this newly stitched piece around my waist and marking the spots where I needed to insert the magnetic snaps. 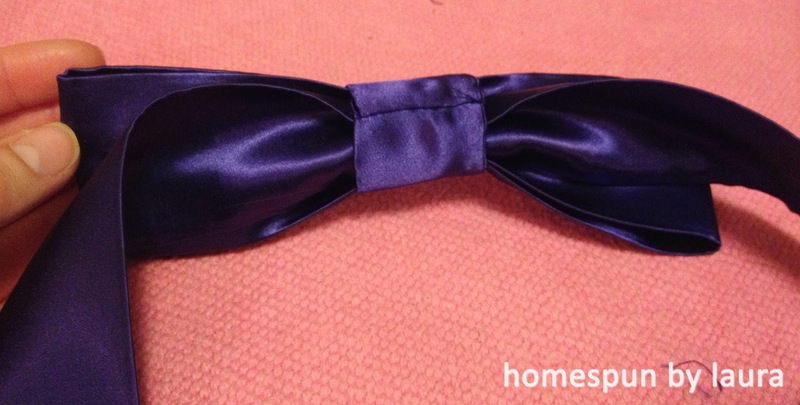 After they were attached in the right places, I closed up the ends of the fabric and moved on to creating the bow. I took about a 15″ length of it and stitched the ends down to create the bow part, then pinched it to create creases in the right spots. Next, I took a small strip and created the middle part of the bow, then slid it on. Last, I finished off the ends of the excess, slid it through the back side of the bow, and hand-stitched it all together. Last, I hand-stitched the entire bow to the belt, directly over the magnetic snaps so it would look like it was all one piece. 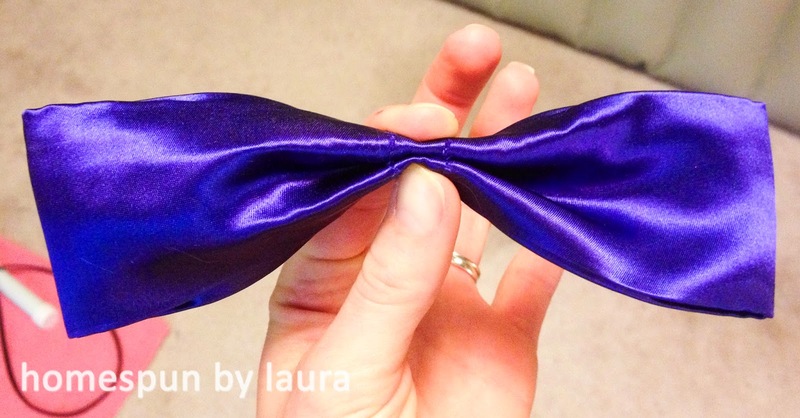 This is a really easy way to make a perfect bow. All you have to do is fluff it and it looks fantastic! 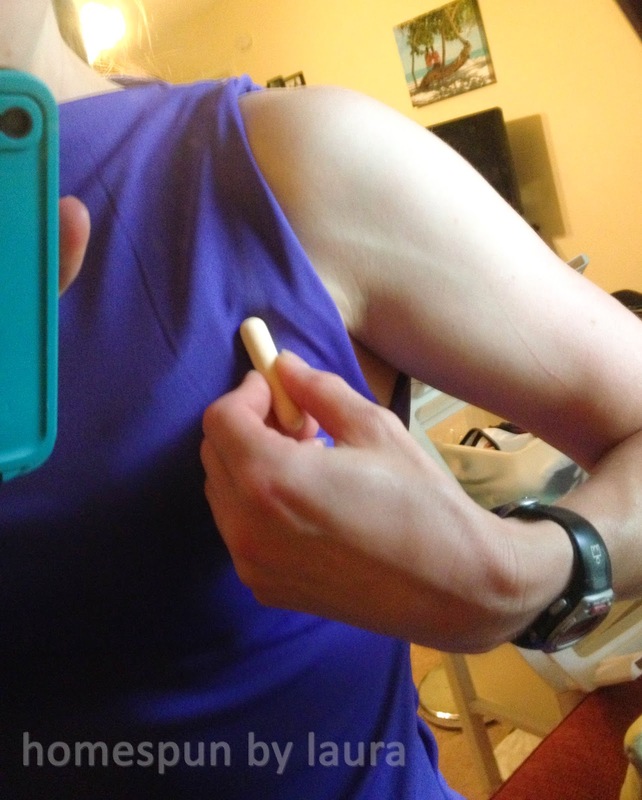 I saved the worst part for last…finishing off the sleeves. Since this was my first time refashioning a dress with a lining, I didn’t realize that this should actually be done BEFORE the neck is stitched up in order to avoid losing your mind. I started this horrible process by trying on the dress for about the 30th time and sketching a bright line over the outline for the left sleeve, then cut the excess down to about 3/4″ (which I later regretted after the right sleeve turned out way wrong – but more about that later). Next, I folded the lining forward (so that the raw edge would end up hidden between the lining and the lace) and basted it. Then, I folded the lace back (so that it would also end up hidden between the lining and the lace) and basted the two layers together from the outside. 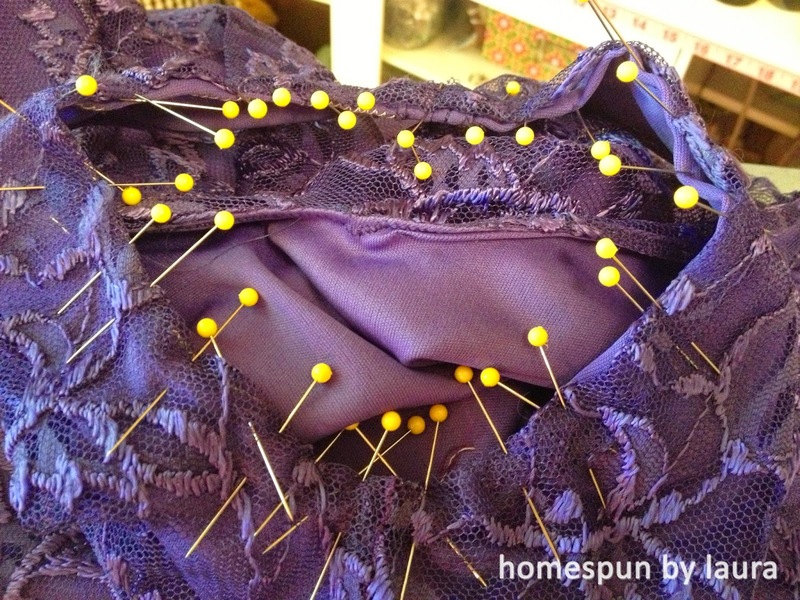 Unfortunately, the multitude of pins was necessary for stitching down a perfect sleeve. Turns out, you can also stitch down a sleeve that is far from perfect with the same number of pins. I tried it on again here for the 31st time. It was perfect. So I stitched a permanent stitch over the basted stitch and pulled out the excess thread. It didn’t turn out to be too big of a deal that it was stitched from the outside because the seam is overpowered by the lace and isn’t very visible. 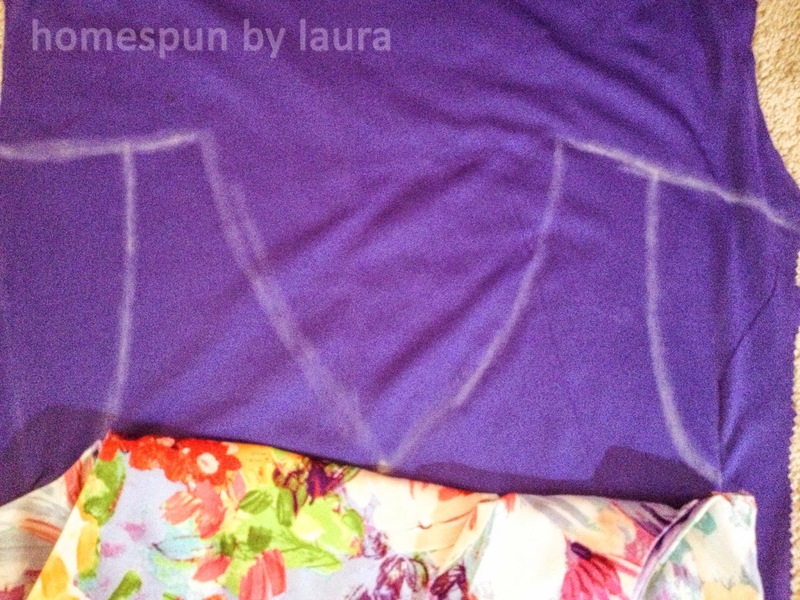 For the right sleeve, I folded the dress over and traced the perfect left sleeve onto the right side. Here, I tried it on for the 32nd time, and for some reason, the traced line on the right side just didn’t look right. So I re-drew a new line and used that one, trimming down the excess before I stitched anything. I immediately regretted having cut off the excess. The second sleeve somehow turned out way too big – it cut in in the front and sagged under the arm. So I ripped out all the stitches, re-pinned and re-sewed it as close to the edge as I could to make it as small as possible – which was still too big. I decided I’d leave it and let my husband take look at it. I figured if he noticed that the sleeves were completely different sizes, I’d definitely need to make some adjustments. I was hoping it was just me being critical of my own work. But no, it was not. The difference in sizes was apparently pretty obvious, because the Mr. noticed it right away. I ran through a few different options and came down to having to 1) somehow add more fabric and 2) just raising the dress at the right sleeve. I went with #2, which wound up making the top half of the dress a bit tighter than was ideal but otherwise wasn’t really noticeable. 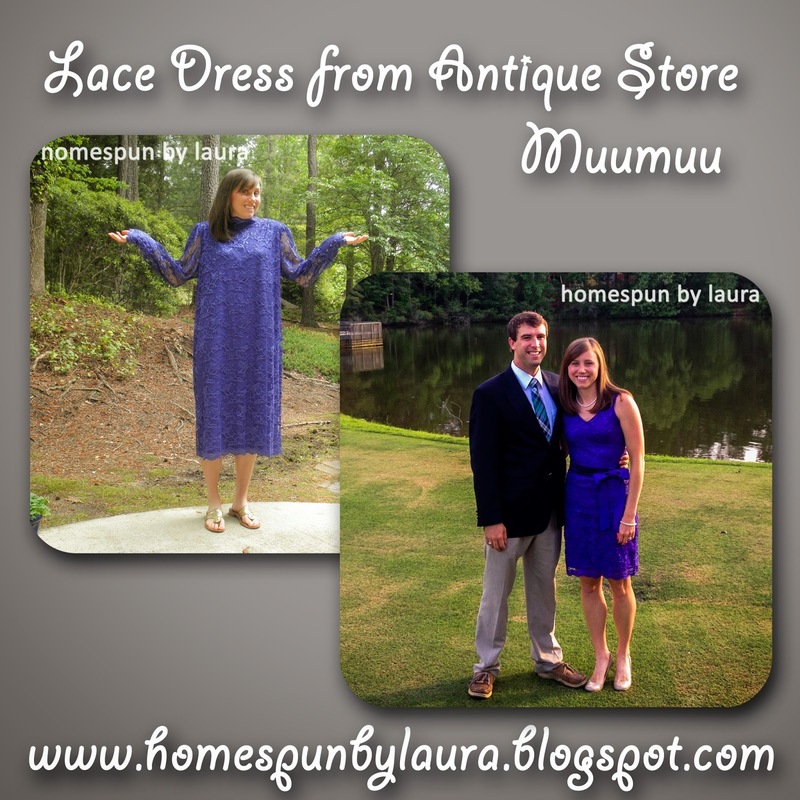 And there you have it, my lovely little lace dress, custom-made for under $10!! I loved getting to wear my handiwork at the wedding and thoroughly enjoyed trying out some of our shag moves (for anyone not from South Carolina, that’s a dance), catching up with high school friends, and watching the bride and groom do a few dance moves of their own.